Remember how you walked to school? How everyone walked to school? Then you walked to the shops (if you were lucky and had 20c for a mixed bag of lollies), then you walked to your mate's house and home again? It's not just “kids these days” who aren't walking – because kids only do what their parents do – it's all of us. The latest research showed that our family is an anomaly by choosing to walk, just for the sake of it. The Herald contacted me to share my ideas and experiences of walking in these changed times. Here's an excerpt of the Sydney Morning Herald article, which is really just the bit where I blab on. But I urge you to take the time to read all of it, because the facts are fascinating and frankly, a little scary too. Tara Wells prefers “incidental walking” – to train stations, the shops or the library. 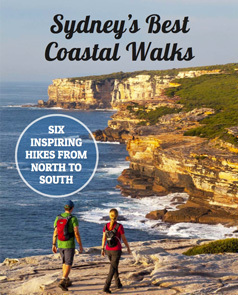 She spent her honeymoon with husband Ian, who runs Sydney Coast Walks, walking most of the way from Manly to Bondi. “What's been lost along the way is just walking for the hell of it,” Wells says, watching them go. “It shouldn't be a big deal that you have gone for a walk. I think we have forgotten how easy it is and what your legs are there to do, if only we would use them.” Read the whole article. I walk for a living and even I found it too easy to stop walking. But I made the decision to put one foot in front of the other, and before you know it, it had become a habit again. How to get walking again. It doesn't take much to step out your door and explore. Inspiration on where to walk in Sydney. Don't have a friend to walk with? Find a walking group. Concerned about walking alone? Don't be. Here's why Sydney is safe to walk alone. Image: Tara Wells photographed by Peter Rae, Fairfax Media.